"Please add our names to the petition; please keep us updated on the outcome." 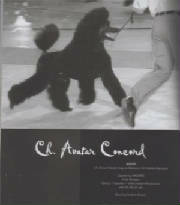 "Great initiativ, let's hope the French Poodle Club will be open for change with a new Presidеnt at the board. However, I do think the petition also should have included Blues as well as Cremes, they are historically colours that have been around longer than the Reds. 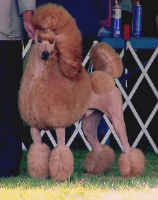 Actually, all solid colours should be allowed, just as in the other acknowleded breed standards for poodles around the globe. The Swedish KC has sent in a petition to the French KC a while ago regarding the same thing, but we haven't heard anything as of yet. Let's keep our fingers crossed!" "It would be best to include Creams and Blue as well as the Red colour when sending your requests as so many whites are off white and are therefore classified as non show able. The Blue gene is also around, more than what most would think. If everyone can stick together, it would have more impact and certainly help the cause. I wish you the best of luck with this endeavor, it would be fantastic if it all works out. AND, it would be so easy to organize, the Reds would compete with the Apricots. The Creams with the Whites and the Blues with the Silvers, so easy and it would increase the gene pool and make the competition stronger." "We, Angelika & Dr. Axel Rudolph, kennel "von der Salana" in Germany, support the initiative to find the acceptance for the red poodles. We want to sign the petition. .. And we want to tell the story of our kennel, breed and our experience. " Click here to read the Breeder's Article. "We would like to join the Petition. We expressed our point of view in our web-site "Devoted to the Red color banning" (click on the link below)"
"I stand behind the petition. 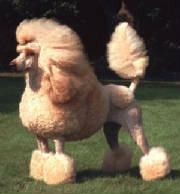 The Swedish Poodle Club has worked for this since at least 1980-1990. They also have taken it up in the meeting with REC. I breed apricot miniature since 1981. I recieved my Kennelname in 1983. 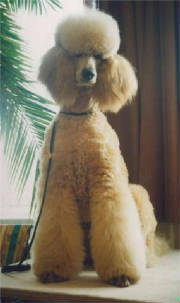 I’m devoted to the apricot color, and it would solve some problems if I knew the correct color of the dogs. 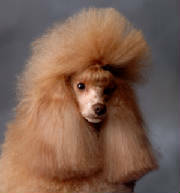 I’m usually using the stud dogs and therefore I don’t see them until they are around 2-3 years old. If they are borned red and lighten, I can’t see this. 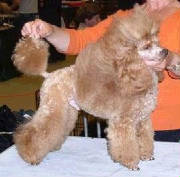 I believe I use a good apricot stud dog without fading and in reality it’s a red that lost it’s color. 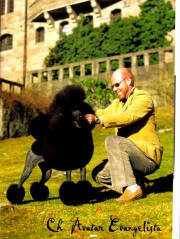 During the years I got 1 Swedish Champion, and several dogs with CC. It’s quite hard to get an apricot miniature to Swedish Champion. I also showed several dogs with excellent. Good luck, and I'm crossing my fingers it will work out this time." "Finally! We have talked about this forever... Its about time!!!!! I will surely sign any petition regarding "the recognition of Reds." "To my mind the most important reason for denying red color is old thinking that red color comes from crossing with red cockers. I was also told a few years ago that the apricot color in the standards comes from crossing with afghans. It is really very sad to hear still such opinions showing missing knowledge in color genetics. It took many years to recognize apricots and silvers, and the question is why Apricots are recognized and Reds not." "I want to join the Petition! 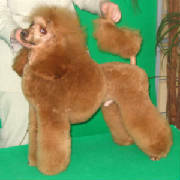 I breed apricot and black miniatures." "I will join the petitin. 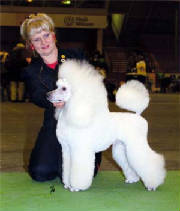 I have bred poodles since 1985,and my kennel name is "Klagstorpsgוrdens Kennel", I had standard poodles in the beginning, two apricot standards from England with outstanding color that never faded. 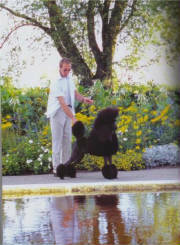 From 1998 I have only toy and dwarf apricot and red poodles. The mother of my first apricot dwarf became JWW-98 in Finland. The red dogs that I have do not lose the color, but some of the apricot do lose the color. Attached are 2 pictures from the same litter ( brother and sister ) they are 3 years old. The male is dark in the color but the female is light. 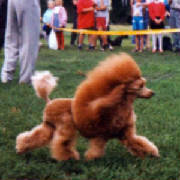 I must see who is the judge at the show because some judges will consider him as a red color dog. 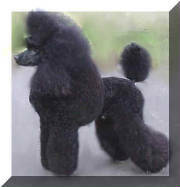 The male produced different puppies, some are dark and some are not." "Please add Cantope Kennel to the petition. Happy Poodling"
"Signing for the petition for red color"
"I fully agree with the written in the petition." "Please include my kennel in the petition". 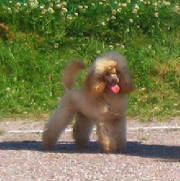 "My name is Elisa from Foscalberto Kennel in Italy. 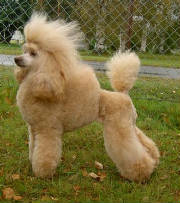 I breed mainly toy and dwarf apricot poodles. I absolutely agree with the petition and happy that it is brought up. 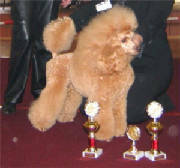 It is the time that Red Poodle should be recognised by the FCI, and separated from the real apricot one.That what creates big problems to the judges during the shows. 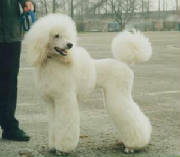 A real apricot poodle near a red one, seems always more light and this as I told you before creates confusion for the judges and also for the breeder, because they don't know which is the right colour to selection and to show. French, Swiss and German judges know and appreciate a good real apricot, while Spanish, English and East European judges prefer darker colour. then the rest of the body. Instead red poodle is always uniform. I've tried to involve the Italian Poodle Kennel Club to join the petition,but unfortunately they probably are not so interested in apricot. material to work, this is a big problem for me. You have to know that I absolutely agree to sign the petition. I wait for the news and send you my best regards." "I would like to join the Petition. 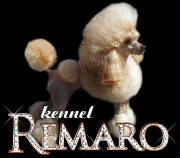 My kennel is very young, but I have been a poodlefan for 9 years and have miniature and toypoodles of different colours. 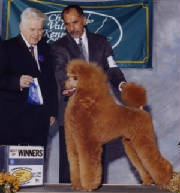 I believe red poodles have the same right to be placed in the FCI standard as I see their number is rather big and many of them are of high quality. I believe it's very important to know the real colour by breeding to keep apricots really apricot and reds really red. "